Ozone is excited to elevate its much-coveted Sunday brunch with a range of sumptuous delicacies specially designed to accompany the complimentary flow of champagne from the exceptional Dom Pérignon. Guests can savor delectable creations prepared by culinary maestro, Chef Rafael Gil, while enjoying spectacular views of Hong Kong’s iconic harbor at the highest bar in the world. Upon arrival, guests will be welcomed with freshly shucked Pacific oysters. Gourmet diners may relish an enticing selection of appetizers at the buffet including cold cut platter, foie gras terrine and weekly soup choices, alongside a fine assortment of sushi, sashimi, cheeses and salads. Chef Rafael also proudly presents Joselito Ham, acclaimed as the best ham in the world, at the carving station. Seafood Station promises to satisfy all cravings with unlimited refills of fresh snow crab legs, Boston lobsters, mussels, spotted crabs and more. 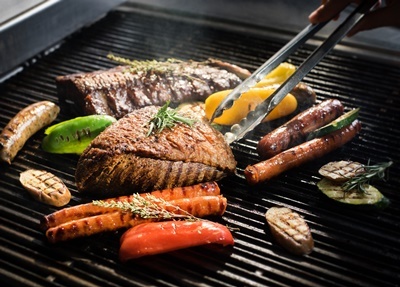 Meat lovers should look no further than the Grill Station serving New Caledonia Blue Prawns, Boston lobsters, Wagyu beef, Spanish pork ribs, and assorted sausages. 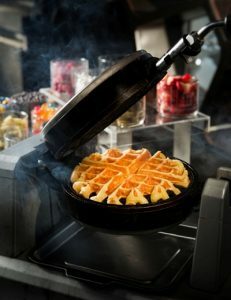 The brunch experience will be capped off with an extensive dessert spread prepared by the hotel’s talented pastry team. 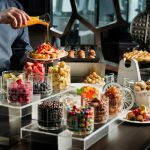 Guests are invited to design their own creations of ice cream, freshly prepared pancakes, poffertjes and waffles with a range of delicious toppings of their choice. Originally from Brazil, Chef Rafael Gil studied business management in preparation for taking over the family business. He then realized his true passion, cooking, and started his culinary training in 2006. Being profoundly gifted and passionate, it did not take long for him to get into world-class Michelin-rated restaurants including three-starred Martin Berasategui restaurant in San Sebastián and one-starred EVO restaurant in Barcelona. In 2013, he set foot in Asia to open Catalunya in Singapore. Chef Rafael joined Ozone at The Ritz-Carlton, Hong Kong in 2015 to bring new energy into the highest bar in the world with his vibrant selection of avant-garde Spanish tapas. All prices are subject to 10% service charge. For reservations, please contact Restaurant Reservations at (852) 2263 2270 or via email restaurantreservation.hk@ritzcarlton.com.